Acer CMO Michael Birkin wants marketing to connect with millennials. However, brands must carefully craft their social messages to reach a very self-aware generation of millennials, Birkin said at the AANA and World Federation of Advertisers (WFA) Global Marketer Conference in Sydney. By 2018, millennials will have the most spending power of any generation ever, Birkin said. Next year, their spending power globally will be $2.5 trillion. However, connecting with them can be a challenge because it is a diverse group in which it’s hard to find common traits, he said. Acer has focussed on one major commonality among the millennials, which is that they all began using the Internet before they were 18 years old, the CMO said. Acer has used this trait to relabel millennials as “the connected generation,” he said. This is a very “self-aware” group that uses social media to carve out their persona, he said. For example, the generation uses selfies and status updates to convey an image of who they are, he said. Marketers must "tap into the connected generation's natural inclination to record their lives," he said. The prominence of social media in their lives has also made millennials more tuned into what their peers are doing. Birkin said that an Acer survey found that 98 per cent said they are more likely to engage with a friend’s recommendation than a sponsored brand post on the Internet. “The importance of word of mouth is greater than it’s ever been, and word of mouth means something very very different in today’s world,” he said. 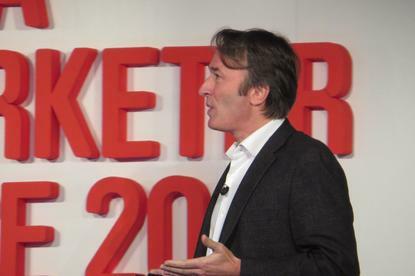 In separate remarks, Unilever senior vice-president of marketing, Marc Mathieu, said marketers today must eschew a purely business view of its potential customers if they want to connect. “We call them target groups … as if we want to shoot them,” he said. “Stop thinking about consumers. Stop thinking about marketers. Stop thinking about advertisers. Start thinking about human beings." Earlier, Pernod Ricard CMO Martin Riley noted that digital has provided the opportunity for a brand “to be part of people’s lives ... on a continual basis,” Riley said. Social media has also turned marketing into a two-way conversation with customers, he said. Now marketers are the “eyes and ears” of the business, he said. However, Riley warned that the rise of digital has also required brands to take positions on public policy issues and ensure that their messages are unified globally. Brands used to be able to focus on each market separately but the Internet has given consumers a view into what the brands are dong throughout the world, he said. As a result, “brands are only as strong as their weakest link,” he said.